Furnished apartment in beautyful Morelia thought to be cozy and practical. This apartment is a place that was thought to be cozy and practical. The decoration is charming and warm, while the kitchen, bathroom and services match the contemporary needs of a modern traveler. Here you will enjoy the possibilities of wi-fi connection, local cellular line, cable TV within a spotless environment. You can sit by our terrace to drink something and relax with your beloved one, chatting about the day experiences and see the magnificent colors of our sunsets. The nicely decorated apartment is 500 squared feet large with full size beds (twins are possible if requested). The bathroom is tiled with talavera mexican ceramics displaying color and coziness. The kitchenette is fully equipped and includes microwave oven, refrigerator, coffee maker and all other appliances topically needed. A table for four people is there for you. Towels and linen are provided and are changed once a week, when the maid comes to do the full cleaning of the apartment. If more frequent maid services are requested, they are possible for an extra fee. Wheather in Morelia is very pleasant, but fresh winter nights may request an extra blanket, you will get it whenever you feel like it. Heating or air conditioning are not installed as they are literally not necessary in Morelia. Although the apartment is not within the World Heritage area, it is only 15 minutes walking distance from it. As the apartment does not face the street, it is very quiet and private. 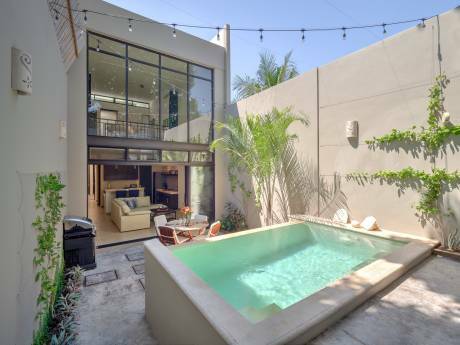 It has a totally independent entrance and fee access to patio and upstairs terrace. Today I am a housewife dedicated to my two teenage kids, not an easy task always. This has taken me temporarily away from my medical carrier. We love traveling and getting to know people from around the world. I love dancing, reading, meeting my life long friends and entertaining friends. I have been told I am a helpful person and I hope I can help you with your travel decisions and needs in Morelia. 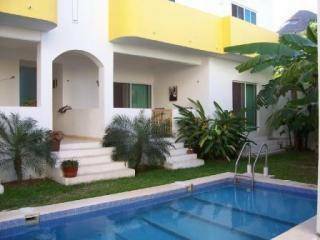 This apartment unit is very well located between the colonial and new areas of Morelia. It is also surrounded by convenient services like beauty parlor, cafes, gyms, bakeries, restaurants, bars, boulevards, churches, stores, a mall, a park, a laundromat and more. The Chapultepec area is a high middle class neighborhood within walking distance to to the touristic World Heritage Downtown area. You will feel very close to historical sites and surrounded by the contemporary Morelia.